Biography: Dr.N.Gokarneshan was born in 1964. He obtained his PhD in textile technology from Anna University, Chennai in 2008. He has industry experience of over 8 years, teaching experience of 20 years and administrative experience of over 6 years. He has made a number of contributions in his field. He has authored 10 books, published over 175 papers in various leading journals, contributed 10 book chapters. He has also presented papers in a number of national as well as international conferences. 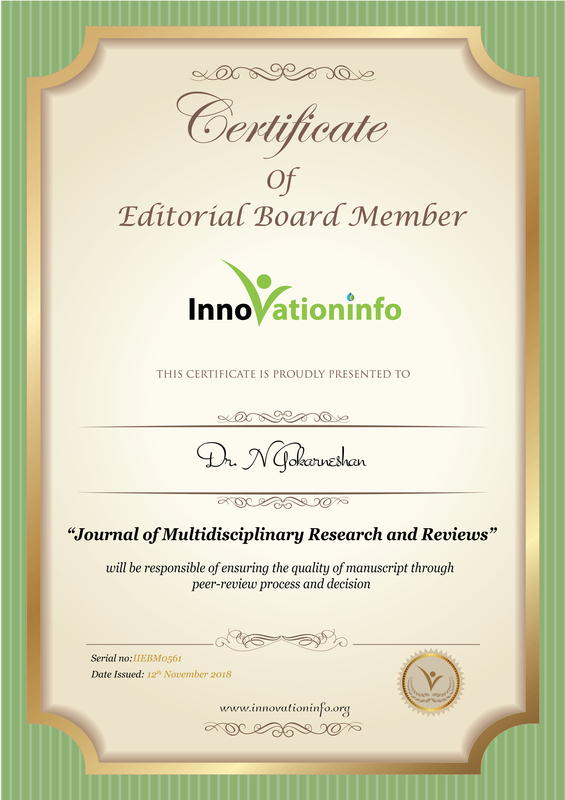 He is a peer reviewer in many leading scientific journals and editorial board member in a number of of journals. He has completed a number of sponsored R&D projects and is also a recipient of many recognitions and awards got outstanding contributions in his field. He is is presently working as General Manager - Operations in a textile company. 1. Medical properties of herbal treated textile materials – some insights on recent research trends, Chronicle of medicine and surgery, 1.2(2017):51-66. 2. Recent Innovations in Textile Sutures - An Approach towards Improved Surgical Procedures. Sci J Biomed Eng Biomed Sci. 2018;2(1): 001-007. 3. Exploring the Potentiality of Knits for Newer Areas of Medical Applications. Sci J Biomed Eng Biomed Sci. 2017;1(1): 007-0019. 4. Effectiveness of Textile Materials in Gynaecology and Obstetrics. Open Acc J Repro & Sexual Disord 1(1) - 2018. 5. Advances in Medical Knits, Journal of Textile Engineering & Fashion Technology, 2017, 3(2): 00095. 6. Application of Nano Silver Particles on Textile Materials for Improvement of Antibacterial Finishes. Glob J Pharmaceu Sci. 2017; 2(3) : 555586. 7. Role of Chitosan in Wound Healing - a Review of the Recent Advances. 2017; 4(3): 555636. DOI: 10.19080/GJARM.2017.04.555637. 8. A Review of Some Sustainable Methods of Silk Dyeing Using Natural Dyes. Curr Trends Chem Eng Process Technol: CTCEPT-102.